Dawn Kirby, BS, LMT, MNLP has been a bodyworker since 1991. She received her Massage Therapy certification from the Denver Center of Advanced Therapy in 1999 and holds advanced certifications in Sports Massage, Advanced Myofascial Release Therapy, Raindrop Therapy, and Bellanina Facelift Massage. She became a Certified Specialist in Muscle Activation techniques in 2007. Dawn’s passion for education led her to the classroom as an instructor in 2003. 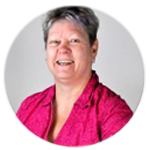 She has taught numerous massage courses including Craniosacral Therapy, Hydrotherapy, Myofascial Release Therapy, Sports Massage, and Deep Tissue & Neuromuscular Reeducation Therapy. In addition she was the Clinic Director and Program Director of the Massage Program at the Denver Career College. She currently teaches Anatomy, Kinesiology, Advanced Myofascial Release, and Sports Massage at the Boulder Massage Therapy Institute.